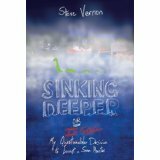 This entry was posted in Reviews & Interviews, Writing and tagged author interview, bestselling author, book giveaway, Canadian author, Sea monster, Silver Birch awards for Children’s Fiction, Steve Vernon, win a book, writer, YA fiction, Young Adult (YA). Bookmark the permalink. I love this interview, Lynn! Steve is the quintessential writer, Hemingway and Stephen King all rolled into one entertaining person! I’d love to win the book, and Bernard Cornwell is one of my favorite authors, too! 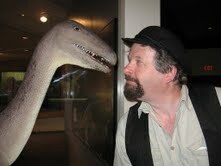 Well – I do have Hemingway’s beard. And…actually…I first discovered Bernard Cornwell’s SHARPE series thanks to a plug for it by Stephen King. Organized chaos – or chaotic organization? Whatever you do – don’t ask my wife! Thanks for the kind comments, folks. Just thought I’d mention that SINKING DEEPER is marked down in the Kobo version to a mere $6.99. That’s almost half-price from the cover price of the traditional paperback – AND, if you order today you can take advantage of the Kobo-wide 20% off sale on all e-books. Fantastic interview. I have been hearing good things about Steve – and his work – for a long while. As a fellow Canadian with snow, it was a pleasure to learn more about the man and his writing. Thanks, Rick. Glad to hear that you’ve been hearing good things. Me, I gave up listening long ago. As a struggling Maritime writer it is encouraging for me to read that dreams can come true if a person continues to put in the time and effort required for success in any profession. Thanks for sharing your story with us, Steve. I’m looking forward to reading your work. I think most of us will agree that if you look up the word “WRITER” in any thesaurus you will find neatly shoe-horned in with “WAITING”, “PATIENCE” and “STRUGGLING”. Congratulations, Steve, on the recognition for this book. And what does 10,000 copies sold make for your Halifax Haunts book — double bestseller, by Canadian standards? Love the title of the sea monster book, and it’s going on my to-read list. I have yet to read any of your books, Steve, and have been putting this off for too long! I have met you before and I could listen to you speak all day! You have a most awesome voice and are a great story teller. You should do some narration for documentaries. I like the advice that WRITERS NEED TO READ – check! 😉 Great interview! Great advice Steve and a wonderful interview Lynn. I would love to win a copy of the book. There is always so much to learn in this writing business so it is wonderful to hear from another perspective. Writers need to read is spot on. So I am going to go and read, right now!